Facts and history about the life and lifestyles of Native American Indians. The Native Indian Dog was extremely important to the tribes of North America. Dogs were primarily used as beasts of burden. Harnessed on wooden frames called travois, the dogs of the Great Plains transported tents, firewood and even children as tribes frequently moved to to different hunting grounds. 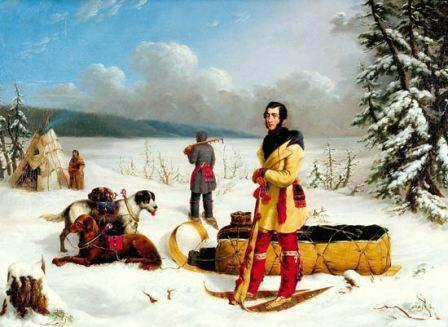 The Native Indian dog of the Arctic and Subarctic tribes pulled sleds across the 'snow desserts'. The Native Indian Dog also provided companionship and protection to the people of different tribes. Dogs were also important as guard dogs, alerting the people to any strangers approaching their camps.